Live Webcam Nellysford, Virginia, USA: Wintergreen Mtn. at 3650 ft. elev. Webcam Nellysford, Virginia, USA: Wintergreen Mtn. at 3650 ft. elev. It's 22:53 in Nellysford, USA right now. Wintergreen Mtn. at 3650 ft. elev. 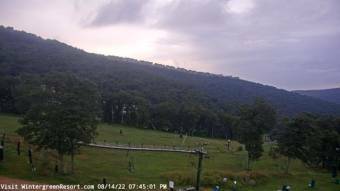 A webcam in Nellysford, Virginia - camera location: Wintergreen Mtn. at 3650 ft. elev..
Staunton, Virginia: Stonewall Jackson Hotel, 21 miles away. Charlottesville, Virginia: Carters Mountain, 23 miles away. Buckingham, Virginia: Buckingham County Middle School, 29.1 miles away. Big Island, Virginia: Big Island Elementary School, 36.2 miles away. Harrisonburg, Virginia: James Madison University, 38.7 miles away. Goochland, Virginia: Byrd Elementary School, 45.5 miles away. Farmville, Virginia: Longwood University, 48.3 miles away. Stanley, Virginia: Honeyville Road, 51.5 miles away.